I have been seeing a lot of KuneKune pigs lately. There were some at a farm I visited in Oregon last month, where my brother buys his eggs. They also have a pair at ZSL London Zoo. 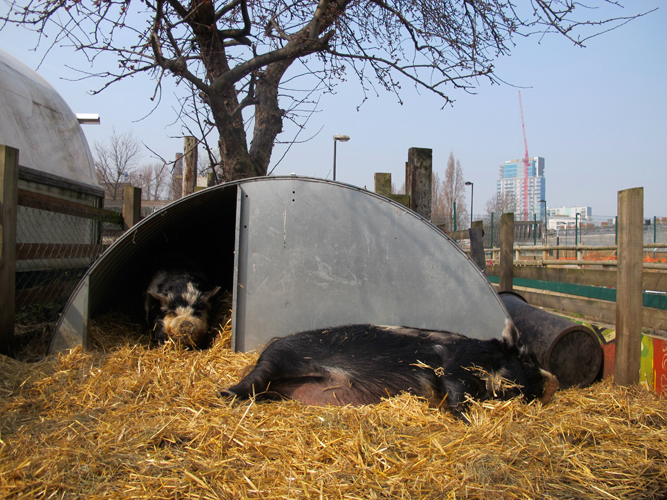 And here are Watson and Holmes, on the Spitalfields City Farm. KuneKunes “fat and round” pigs come from New Zealand, though their origin is believed to have been China. They are a small domestic breed that are hairy and have wattles (pire pire) hanging from their lower jaw. I am told that sometimes when they are piglets, they mistake the wattles for teats and bite them off. I am assured that this is not as painful as it sounds. They are friendly and intelligent pigs that enjoy human company. Thanks to a breeding program initiated in the 1980’s, they no longer face extinction, with breeding societies in New Zealand and the United Kingdom. This entry was posted in pigs, ZSL London Zoo and tagged KuneKune, New Zealand, pigs, rare breed, Spitalfields City Farm, ZSL London Zoo by samanthasweeting. Bookmark the permalink.